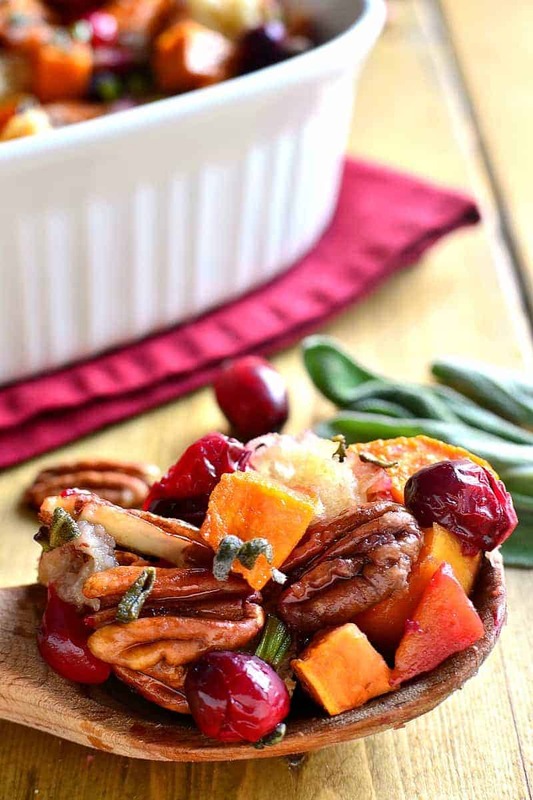 This Sweet Potato Cranberry Pecan Stuffing recipe is a little bit sweet, a little bit savory, and the perfect addition to your Thanksgiving or Christmas table! 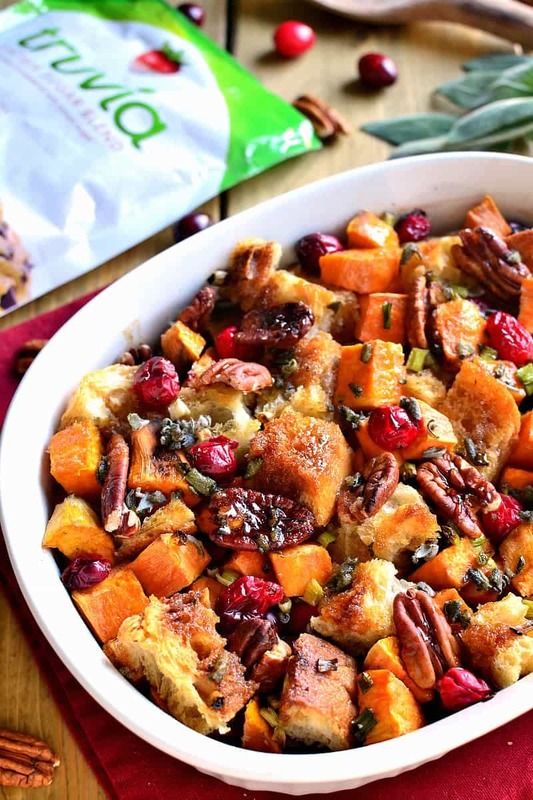 A whole new take on stuffing! I partnered with Truvia to bring you this recipe, but as always all ideas and opinions are my own. I had an interesting conversation with my kids last night. About the difference between being an adult and being a kid. I wasn’t trying to burst their bubble….really….it just happened that way. I guess that’s part of growing up, right? The conversation we were having was about our upcoming weekends….weekends that are jam packed with plans. Of course, all the plans are fun ones, but we all know that before the fun comes lots of work. So the girls were talking about how excited they are…and even though I know I shouldn’t have done it…I felt the need to remind them of of everything that needed to get done before I could feel as excited as they did. Bubble burst. But you know what I found especially interesting? And promising? They got it. Instantly! And even though I don’t necessarily want them to feel anything but excited….the truth is a little help would be nice. And the more they get it, the more likely they are to help. With things like cleaning up after themselves. Making their beds. And maybe, if I play my cards right, someday soon they’ll be helping with things like making ALL the holiday food. But until that day comes, you know what makes things easier? Having a plan. Knowing what I’m going to make is always half the battle! And I have the feeling I’m not the only one. So if you’re anything like me, I’ll make things easy. 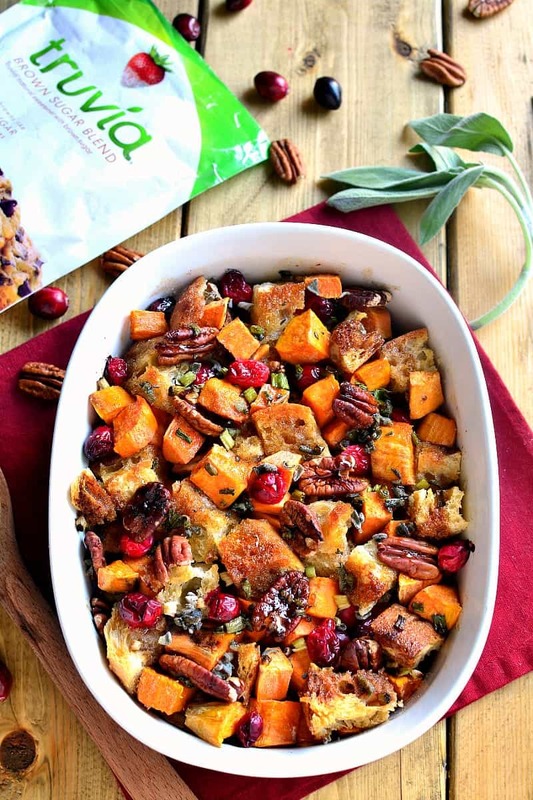 Make this Sweet Potato Cranberry Pecan Stuffing!! It’s the perfect blend of savory and sweet, and I love that it’s lightened up with sweet potatoes and Truvia Brown Sugar Blend. Because holiday meals are heavy….and getting ready for them can feel pretty heavy, too! So do yourself a favor, and lighten things up this year. 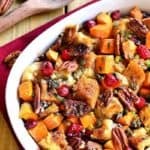 Ask for help, plan your menu early, and enjoy an extra helping of this Sweet Potato Cranberry Pecan Stuffing. You can thank me later! In a separate small bowl, combine melted butter and Truvia Brown Sugar Blend. Drizzle evenly over stuffing mixture. 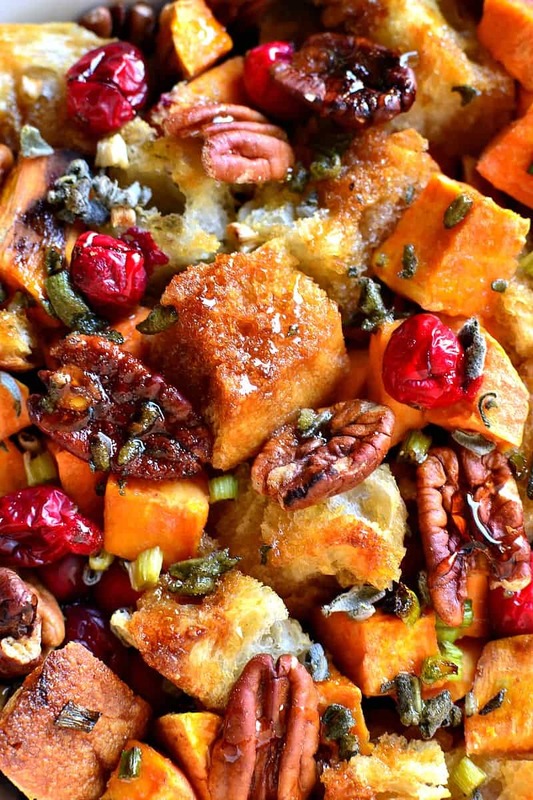 This is probably one of the most gorgeous stuffing recipes I’ve ever seen. It looks delicious! Why thank you, Michelle! That’s such a great compliment! This looks delicious, what a delicious recipe! Oh and I’m always bursting bubbles around here, it’s sort of my “thing” ;)! I think I may try this recipe this weekend! 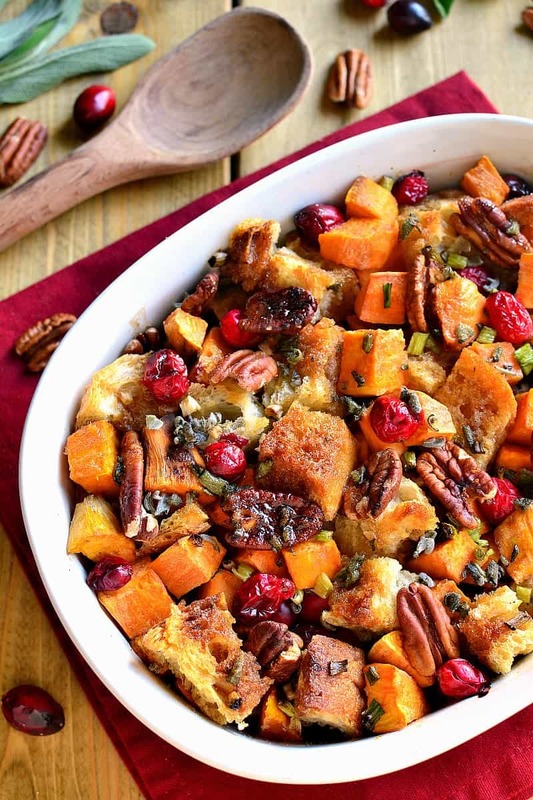 I’m totally wondering why I never thought to add sweet potatoes to a stuffing dish! What a brilliant recipe you’ve created — it looks amazing! Thanks, Patricia! I loved the added flavor and texture…hope you do too! WOW!! What an aaamaazing stuffing!! I need to try this!! Oh wow! My eyes feast with these flavors! So fun and festive! I can’t wait to try! THAT looks perfect!! Absolutely gorgeous! Saving for Thanksgiving for sure! Yum! I’ve had the same conversation with my kids, too. Even though it bursts the bubble sometimes, I also think that they take pride in helping be a part of the planning process. As for this stuffing, I could happily eat JUST THIS on Thanksgiving. 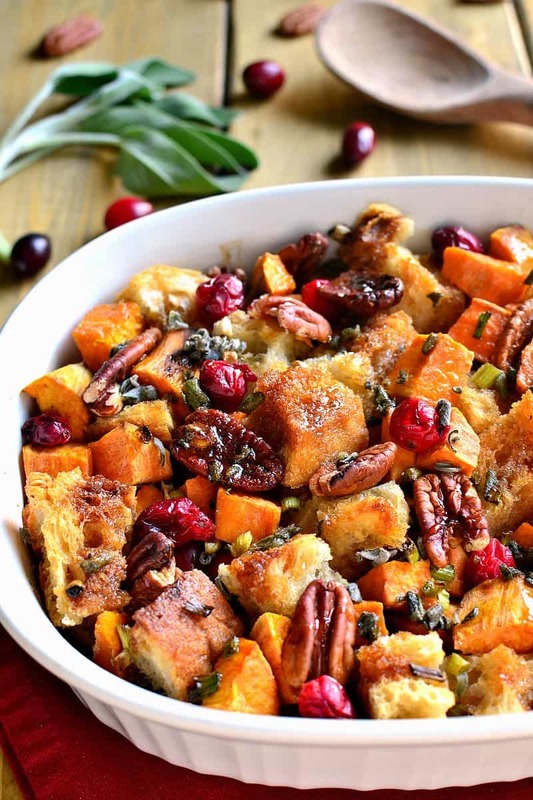 What is the best way to re-heat leftovers of this gorgeous stuffing? I would reheat, covered, in the oven.